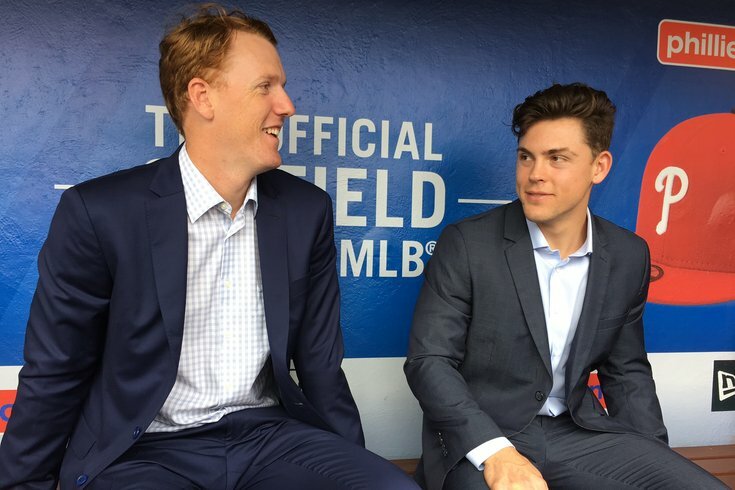 Tom Eshelman and Scott Kingery were honored prior to Tuesday's Phillies games as recipients of the prestigious Paul Owens Award, given to the top pitcher and hitter in the team's minor league system annually. A group of 12 men took the field at Citizens Bank Park about 10 minutes before first pitch on Tuesday night. Right-hander Tom Eshelman and infielder Scott Kingery were receiving their awards as the 2017 recipients of the prestigious Paul Owens Award, bestowed on the best pitcher and player in the minor league system each year, and 10 former winners joined them for a photo, a group that included Phillies first base coach Mickey Morandini and another former famous second baseman in club history, Dodgers veteran Chase Utley. Utley in Dodger blue certainly stood out in a photo that was a testament to the more recent success of the Phillies farm system. But so did this: among the active players pictured there were five infielders, Freddy Galvis, J.P. Crawford, Maikel Franco, Rhys Hoskins, and Kingery. Cool moment pregame: We honored former Paul Owens Award winners. And, well, we all know there is only room for four infielders in an infield. And another pretty good infielder, Cesar Hernandez (who ranks third among all leadoff hitters in on-base percentage since the start of last year), was in uniform in the dugout, too. It all leads to an interesting question if you’re one of those infielders: is there a little uncertainty not knowing who is going to be where in say, two years? Again, there’s only room for four, and it would appear Rhys Hoskins has a pretty strong grip on first base. “I mean, honestly anything can happen,” Kingery said. This is probably worth repeating: anything can happen. General manager Matt Klentak even offered a scenario less than two weeks ago that had all of them with the organization again in 2018, which might not be that far-fetched (as the Chicago Cubs and Los Angeles Dodgers have proven in recent years, depth is important) except for the fact that the Phillies have real needs elsewhere on the roster, namely starting pitching. If J.P. Crawford is just so-so in the next two weeks, he could begin 2018 at Triple-A Lehigh Valley as the starting shortstop with Kingery at second base as his double-play partner. Although in the very small sample size so far, Crawford, who tore it up offensively in his final 2 1/2 months in Allentown, has fared well with six walks and four doubles in 13 games to go alongside sparkling defense wherever he’s played in the infield. So, again, it’s both complicated and crowded (although Galvis’ pending free agency after next season clears it up a bit). And, again, anything can happen. Fans may want the Phillies to package Tommy Joseph, Cesar Hernandez, and Jake Thompson in a trade to get an effective starter to pair alongside Aaron Nola in a trade this winter, but that’s not really how trades work. You can’t just get rid of the guys you’re no longer into; the other teams have smart people running their baseball operations departments, it’s not like they’re the lugs in your fantasy football league. Perhaps it’s Kingery or Franco (or both) that could lead a package for a young, under-team-control, top-of-the-rotation starting pitcher. The Phils front office will have to consider all options and consider them carefully. Because two years down the road, you better have made the right call if you want to hold onto your job. And as Franco has shown, not every top prospect turns into what you thought they’d become 2-3 years down the road. Maybe it will be Hernandez who is shopped this winter to clear an opening (first for Crawford, and then for Galvis, too, when Kingery is deemed big league-ready). But, as Kingery said, anything can happen and if you’re a fan hoping to see a major upgrade to the rotation, you might want to at least prepare yourself for an uncomfortable trade if you want that to happen. Footnote: With more payroll flexibility moving into 2018 than any team other than the Oakland Athletics, the Phillies could just as easily open the bank for a top free agent like Jake Arrieta or the guy who took the mound for the Dodgers on Tuesday, Yu Darvish. But, given the volatility of pitchers over 30, and the amount of money you have to give them, it’d probably be more prudent to trade for a younger starter and save that cash for the star-studded free agent class of 2018-19, when Bryce Harper, Andrew McCutchen, Adam Jones, Clayton Kershaw (if he exercises an opt-out clause), and even more infielders, Manny Machado, Josh Donaldson, and Daniel Murphy will be available. Tom Eshelman is probably on the short list of Phillies prospects who saw his stock rise the most during the 2017 season. Although known for his uncanny command since being drafted in the second round by the Houston Astros out of Cal State Fullerton in 2015, Eshelman wasn’t ever a power pitcher, and thus, not a popular name come time for prospect ranking lists. 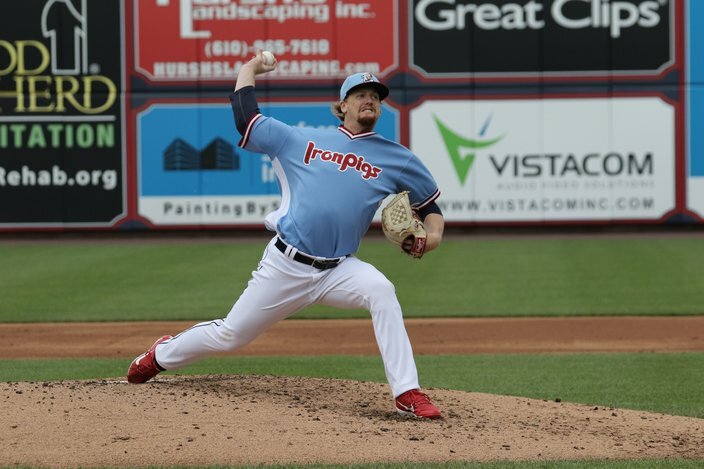 Although his fastball hovers around 90 MPH, the 23-year-old was plenty effective in 23 starts between Triple-A Lehigh Valley and Double-A Reading in 2017, sporting a 2.40 ERA, a 0.97 WHIP, a .233 opponents’ batting average and a gaudy 102-to-18 strikeout-to-walk ratio in 150.0 innings. Sounds like a guy the Phillies could have used at some point in the second half, eh? Although the Phils entered play Tuesday with a modest 30-33 record since the All-Star break, their starting pitchers not named Aaron Nola have gone 15-20 with a 5.76 ERA in 51 games. But Eshelman, like Scott Kingery and unlike J.P. Crawford, Rhys Hoskins and others, does not have to be added to the 40-man roster this winter. The Phillies front office has to carefully manipulate their prospects toward the end of each year so they can protect those eligible for the Rule 5 Draft. Eshelman and Kingery, drafted out of college within three picks of each other two years ago, aren’t eligible for the Rule 5 Draft. Crawford, Hoskins, Carlos Tocci, Andrew Pullin, and Seranthony Dominguez are among those that are eligible for the Rule 5 Draft. 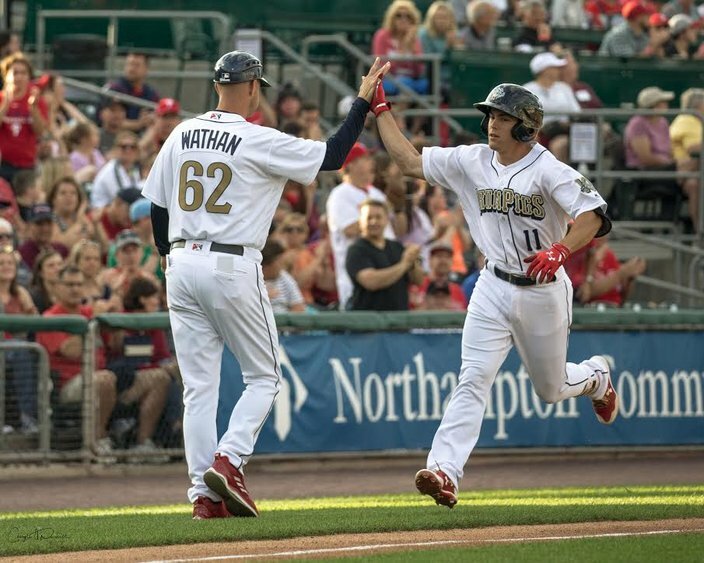 For what it’s worth, neither Kingery (who hit .304 with an .889 OPS, 26 home runs and 29 stolen bases in 132 games between Triple-A and Double-A) or Eshelman seem bothered by it.